NAT Gateway is an enterprise-class public network gateway, providing proxy services (SNAT and DNAT), up to 10 Gbps forwarding capacity, and cross-zone disaster recovery. NAT Gateway helps you establish an Internet gateway for a VPC by configuring SNAT and DNAT entries, allowing more flexible use of network resources. NAT Gateway is an extremely stable gateway service, which has been used in disaster recovery across zones. Supports bandwidth sharing, which allows multiple VPC-connected ECS instances to share Internet bandwidth. This reduces the bandwidth costs. Provides an easy-to-use console, which supports NAT rule customization and data visualization. A NAT gateway can support up to 10 Gbps of throughput and one million connections, to meet the requirements of super large business system deployment in the cloud. Supports source network address translation (SNAT). VPC-connected ECS instances can use the same EIP to access the Internet. Maps IP addresses of VSwitches to EIPs. ECS instances connected to the same VSwitch in a VPC can use the same EIP to access the Internet. This means that you do not have to manage an EIP for each ECS instance. Supports CIDR rules for VSwitches. You can submit a ticket to request more fine-grained CIDR rules. Supports destination network address translation (SNAT). VPC-connected ECS instances can use the same EIP to deliver services to the Internet. Maps internal ports on ECS instances to external ports on a NAT gateway. This enables applications running these internal ports to deliver services to the Internet. Maps IP addresses of VPC-connected ECS instances to EIPs. This enables the ECS instances to deliver services to the Internet. In this scenario, ECS instances are created in VPCs for applications to deliver services to the Internet. Network traffic on these applications do not share the same peak hour. To minimize the influence of network traffic fluctuations and reduce the bandwidth costs, you can allow multiple IP addresses to share the same bandwidth. 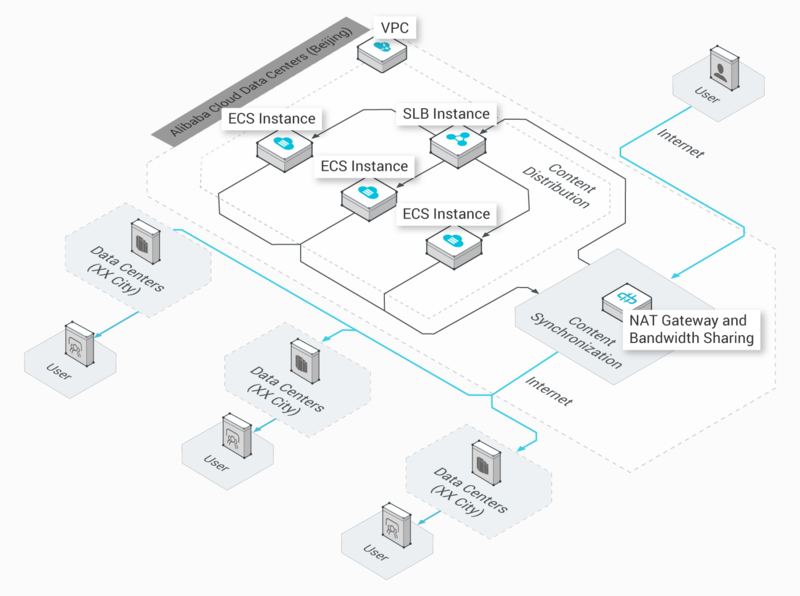 VPC-connected ECS instances can deliver services to the Internet through port mapping and IP address mapping. VPC-connected ECS instances can share Internet bandwidth to reduce costs. NAT Gateway supports high bandwidth throughput and a large number of connections. In this scenario, business modules are created in VPCs to interact with Other business systems that have been deployed in on-premise data centers. To provide reliable high-definition video services, VPC-connected ECS instances must access the Internet to deliver the content processed in the cloud to the data centers. 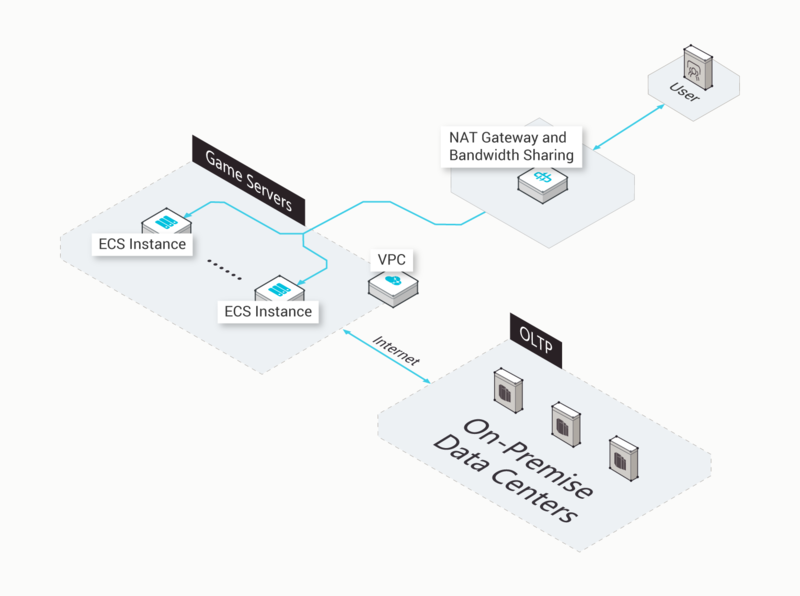 VPC-connected ECS instances use SNAT to access the Internet, which enables you to manage these instances more efficiently. Multiple VPC-connected ECS instances can share the same EIP to prevent management and security issues.